Rose arrives to her wedding in dress made by Elie Saab Bridal. She's escorted to the church by her father Sebastian Leslie. Kit looks dapper as he arrives. Jon Snow and Ygritte are married! 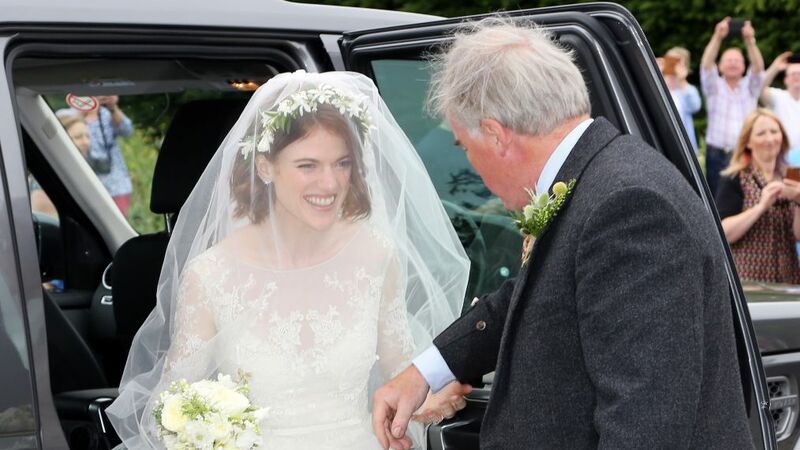 The couple, who met while filming Game of Thrones in 2012 and whose real names are Kit Harington and Rose Leslie, tied the knot on Saturday, June 23, at the Rayne Church in Aberdeen, Scotland. Joining the gorgeous couple on their special was most of the cast from the HBO series — Emilia Clarke (Daenerys Targaryen), Peter Dinklage (Tyrion Lannister), Sophie Turner (Sansa Stark) and Maisie Williams (Arya Stark), just to name a few. Harington and Leslie announced their engagement in September 2017, after confirming their relationship in April 2016. We guess he does know something after all! Click through the gallery above for pics from the ceremony.